Purchase it now!!! - Get it on Kindle - Ipad - or Paper Back at Amazon. Learn about heaven and God’s promises in this book inspired by the Holy Spirit. Minister Rosalind spent hours in prayer, reading and listening to the Holy Bible. She has gathered and now published numerous prayers to help you with your struggles in every area of life. Never knowing how soon life will end, are you prepared to meet God? The Good News is that you can be ready to spend eternity in heaven no matter what happens in life. Get ready now to triumph even in death. 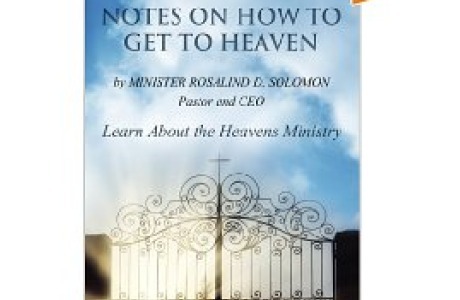 Notes On How To Get To Heaven reveals God’s promises. Minister Rosalind D. Solomon spent hours in prayer, reading the Word of God in The Holy Bible and listening to King Jesus Christ in Vision and Dreams. She has gathered and now published this teaching guide also a deliverance guide ,it talks about Incubus and Succubus Waster demon etc. Also has 43 deliverance prayers on theses subject. A strong prophetic word at end of book this book teaches about satan what he can do and can not do. As well as a host of other spiritual warfare things., so you can learn how to make it to Heaven, how to walk with King Jesus with God and with the Holy Ghost Spirit of God. There are numerous prayers to help you with your struggles in every area of life. Never knowing how soon life will end, are you prepared to meet God? The Good News is that you can be ready to spend eternity in Heaven no matter what happens in life. Get ready now to triumph in life and even in death.